I have been so intrigued by the things that Julie has been doing with white pencils on Kraft colored paper, I just had to try it myself!! It's super fun! And super simple - but it really gives you an awesome effect! Things have been the normal crazy around here! Getting my oldest started on our lessons for the year (the second year of homeschooling is going much more smoothly than the first! ), getting my 3 year old ready to start preschool next week, and trying to control my wild toddler! Are you loving the new A Muse website? Isn't it so fun! If you haven't checked it out - get going! After an amazing amount of work by the incredible A Muse staff, our new website is up and running!!! You can now order all of the amazing A Muse products online, with just a click of your mouse!! And not just A Muse stamps! You can also order the amazing Salt Box Studio stamps (I have to get my hands on the sunflowers!) and the exclusive to A Muse Elzybell's images! So grab your credit card and head on over!! You will not be dissappointed!! BTW - If you use Firefox as your browser, make sure that you have the most updated version - things on the new site like to jump around (they are just so excited!) with the older versions! The craft room mini-makeover is getting there - not quite done yet! The paint is on the walls - I was going to show you the color online, but it looks nothing like the color on the walls! It is a silvery blue color - not as bright as SU Bashful Blue, but a bit more saturated than Soft Sky. I am planning on some cream and chocolate accents, and making the room more "family" friendly since it is the room that we usually use for school! I think things are going to be a bit more difficult this year because Lily is 19 months old and wants to be right in the middle of everything, and if you tell her "no" she throws herself on the floor and SCREAMS! Ahh, toddlers ... they are so much fun!! I promise I will take pictures when things are finished! It may be the best decorated room in my house!! I needed a sympathy card last week. This came together so quickly - although I think I was a bit heavy handed with my sponging!! 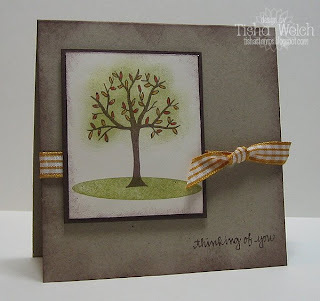 I have just been loving this leafy tree stamp lately!! I am using it for everything! Hope that all is going well for you and yours! I think we are finally over all the germs in this house - the black cloud is lifting! 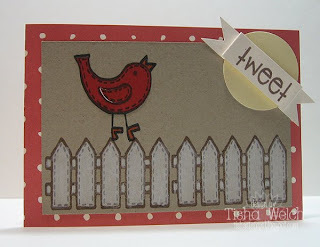 We are having awesome weather ... it has cooled down, and we should be outside more, but we are busy in the craft room!! Oh-well!! 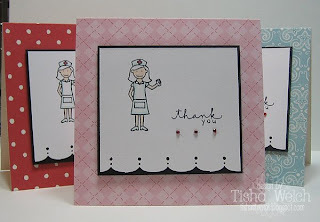 Details: Stamps by A Muse, inks by SU, Momento, ribbon by May Arts. Where does the time go?? I really can not believe that it is August - except for all the back-to-school sales, my itch to buy pencils, and paper and crayons, and the blistering heat here in the Midwest! Things have been just crazy around here - sick kids (bad), sick husband (even worse!) and trying to get ready for our 2nd year of homeschooling!! I got a wild hair in my you-know-where yesterday and decided that my craft room/classroom needed a new coat of paint before we could even think about starting school! I am about halfway done now - just need some kids to nap so I can keep painting! I really *have* to be done by this weekend so we can start school on Monday! Okay - on to the stamping! 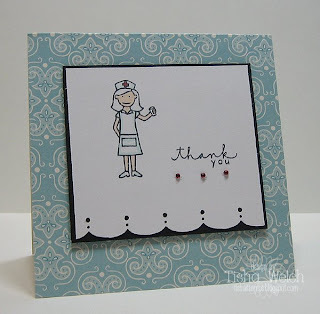 All the sickies around here have needed a few "nursey" thank you's for the amazing nurses that took care of us - who are also my friends and co-workers! I kept it nice and simple - just the way I like it! These will get a little gift card to the coffee shop at the hospital stuck inside! A few more of the same card! Details: Stamps, note cards, twinkles by A Muse. Colored with Copics and Spicas.